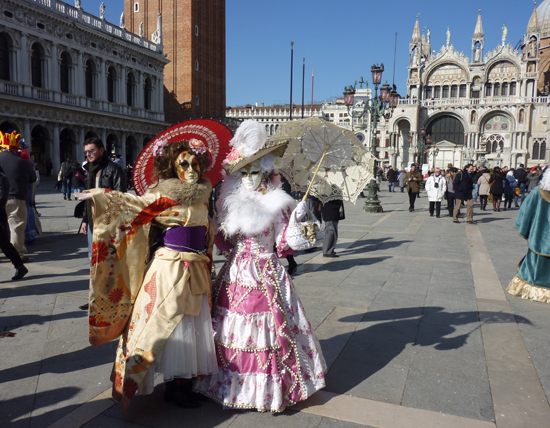 Venice Carnival - Where's Your Mask for Carnival in Venice? Venice's 2012 Carnival invites you to get masked! Carnivale is a centuries-old Venetian tradition, which takes place annually, beginning the day before Ash Wednesday and ending on Shrove Tuesday (or Fat Tuesday). The word “carnival” comes from the Latin for “farewell, meat!” because of its ties to Lent, a period of 40 days prior to Easter in which Christians would abstain from eating meat, giving Venetians an excuse to throw lavish parties to devour whatever meat they had before Lent began. The extravagance and licentiousness exhibited in these festivities aided in giving Venice’s Carnival the reputation and tradition of liberating the Venetians from social roles and inhibitions—something that was facilitated by the use of the mask. By the end of the 13th century, Venetians were adorning elaborate masks during the Carnival season, which not only made it impossible to identify each other, but also extremely difficult for them to decipher the social standing of a fellow Venetian. The masks also helped Venetians, who were avid gamblers, to hide from their creditors in the city’s many casinos. After the 18th century, Carnival saw a decline in its significance until the 1930s when Italian dictator Mussolini abolished it. In 1979, however, a group of Venetians successfully revived the tradition. 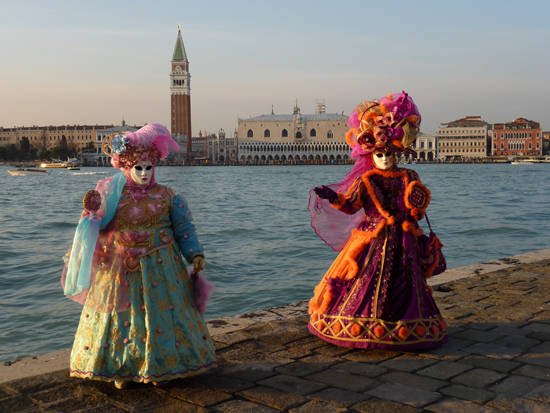 Today, Carnival is one of Venice’s top cultural events, bringing in ever-growing number of masked merrymakers. This year’s theme, “Life is Theater! It’s Time to Get Masked!”, stems from the Carnival’s close connection to another important aspect of Venetian life: the theater. 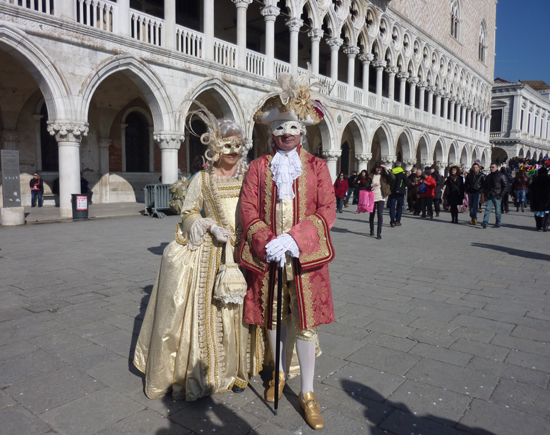 In centuries past, Carnival coincided with a busy theater season, which the Venetians as well as visiting Europeans would attend fully masked and in sumptuous dress. Carnival also helped make Commedia dell’Arte (a form of sketch comedy characterized by a set cast of specific roles performed by masked actors) famous throughout Europe because of the many shows that would happen during its festivities. 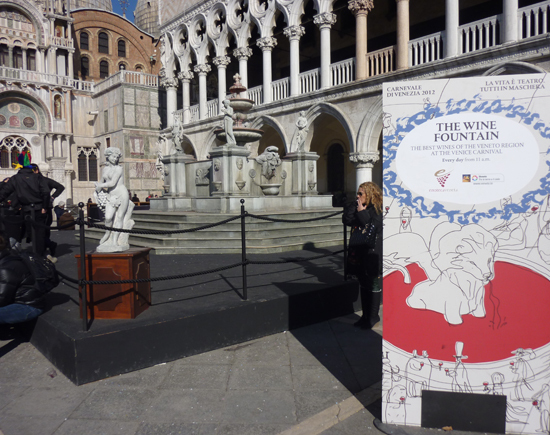 From February 4 – 21, 2012, Venice will open its arms to hundreds of thousands of visitors, who have come to see the various shows, concerts, recitals, performances and contests programmed by the event’s organizers in Venice’s theaters, public squares, palaces, and Casinò. It is fitting that for the occasion, Venice’s focal point — Piazza San Marco — has been transformed into the Grande Teatro, the Grand Theater, where many of the important spectacles will take place. However, even walking the city’s narrow streets, or calle, where you mingle with masked characters, who seem to have stepped out of the 18th century, is a highly-entertaining and captivating theatrical sight. Carnival's nomadic spectacle "In Venice, Life is Theater"
Have a look on our posts about Carnival in Sardinia, Puglia and Tuscany!